We believe many yachtsmen have been waiting for this new launching, from the famous yard which has set many times the state of both yacht design and engineering and which, after some ups and downs, has finally reached its optimal course, projected to the future without disregarding tradition and elegance. By introducing the new 54 Aquarius, Riva yard has really magnetized everybody's attention at the last Genova International Boat Show; the yacht is, probably, one of the most perfect example of design, where innovation style and the unique Riva charm are masterly mixed together. This open boat feature plenty of space outside, where sophisticated and rational solutions, such as the spacious aft sun bathing area with hydraulic gangway and tender storage area underneath, the beautiful cockpit furniture with ice-maker and gill area and the comfortable dinette with adjustable table, have been adopted with an almost perfect degree of finishing throughout, as usual on Riva's yachts. The teak and stainless steel handrail, the elegant cup-holder in the forward sun bathing area and the excellent dashboard are just some examples of the incredible attention to detailing. Average miles range, at a given rpm, is obtained dividing the total fuel capacity (2500 liters) for the "liters/mile" corresponding to the entered rpm. Plotted fuel consumption is declared by the engines' manufacturer: tuning of the engines, weight of persons, stores, etc... on board, hull conditions and propeller type can effect the real fuel consumption. Construction material: hull side: fiberglass balsa sandwich construction, hull bottom: solid fiberglass. Deck and particulars material: fiberglass balsa sandwich construction, stainless steel deck fittings. Fore deck: windlass, Fortess anchor 47 kg, four cleats on each side, sun-bathing area, teak and stainless steel handrail, hatch, fore cleats, teak drink holder. Cockpit particulars: steering station and charting area, pilot seat an settee, U shaped dinette with extensible table, aft sun-bathing area with tender storage underneath, hydraulic actuated hatch, stainless steel and toughened glass sliding entrance door to the underdeck area, teak handrail. 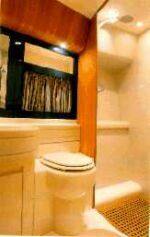 Swimming platform particulars: teak planking, hot and cold water shower, fully hidden hydraulic gangway, entrance door to the crew quater. Superstructure and windows material: fiberglass radar arch, toughened glass windshield. Lay-out and main features: forward owner cabin with double bed and en-suite bathroom with separated shower, saloon area with U shaped dinette and extensible table, wet bar, fully hidden galley, guest cabin on the port side with double bed or twin beds on request, guest cabin< on the starboard side with separated shower, leather upholstery, velvet-feel exotic woods, aft crew cabin (access from the cockpit) with bed, locker, separated bathroom and stereo system. Steering station: six persons settee, wheel, throttles, compass, engines alarms, gauges and instruments, auto-pilot, depth sounder, GPS (connected to the auto-pilot), horn, log, search light, VHF, chart table to the starboard side. 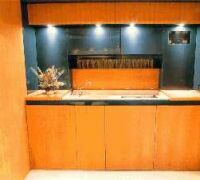 Galley: fully hidden with sink and ceramic-glass cooking top, blower, six persons dinner-set, refrigerator, freezer, microwave oven, hanging lockers, storage lockers and drawers. Standard equipment: salt water deck washing plant, 220 v shore line socket and telephone plug, cockpit refrigerator and ice-maker, stereo system with CD player in the saloon, reversible air conditioning, convertible top, chain washing pump. Optional: Riva meteo station, plotter, radar, SSB. Seakeeping: the boat feature excellent stability and gives a safety feeling, soft wave impact (tested crossing the course of the support boat). Maneuverability is always safe and effective, while turns are smooth and precise. Rudder and trim tabs response: very effective and precise. Docking capabilities: the perfect position of deck mooring equipment, together with comfortable side walkways allow safe docking maneuvers; the boat feature excellent maneuverability in narrow waters. Deck: safe to walk and completely fitted; the teak and stainless steel handrails are very practical and elegant. Interiors: outstanding elegance throughout with perfect joiner work and finishing. 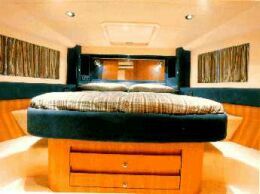 The internal lay-out with only two spacious cabins and bathrooms is in our opinion an excellent design choice. Pleasing internal lighting solutions. 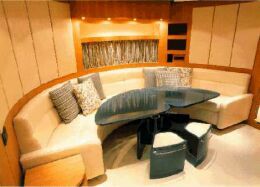 Passengers comfort: excellent under way, while the well conceived interiors ensure the required privacy. Steering comfort: very good, thanks to the comfortable pilot seat and the well placed and complete dashboard. Chart table: two charting areas are available to the dashboard's starboard side. Galley: very nice and elegant with quality accessories. Bathrooms: spacious, with excellent finishing and plenty of light. Engine room space: the entrance door is sufficiently comfortable, while the spacious engine room ensure practical maintenance works. Electrical plant: rationally and elegantly placed. the engine room entrance door.